The Yomiuri Giants lost a two-run lead on Toshiya Sugiuchi’s watch. So it was only natural that the left-hander be the one to put the Kyojin back on top. 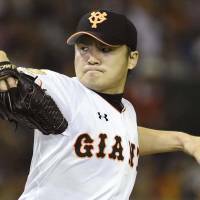 Sugiuchi singled in the tiebreaking run in the fourth, and he and three relief pitchers made a slim advantage hold up the rest of the way as the Giants edged the Tokyo Yakult Swallows 3-2 in front of a crowd of 44,691 on Saturday night at Tokyo Dome. Sugiuchi (4-1) allowed three hits, struck out seven and walked three. Shingo Kawabata’s two-run home run was all the offense Yakult could muster against the Yomiuri lefty. “I felt I had to pitch extremely well tonight and I did that except for the one mistake to Kawabata,” Sugiuchi said. The Giants had a two-run lead when Sugiuchi gave up that homer to Kawabata in the top of the fourth. He made up for it in the bottom half with a two-out RBI single up the middle that put the Kyojin ahead to stay. Relievers Yuki Koyama and Tetsuya Yamaguchi worked the seventh and eighth innings for Yomiuri. Closer Hirokazu Sawamura pitched around Kawabata’s leadoff single in the ninth to nail down his 14th save of the year. 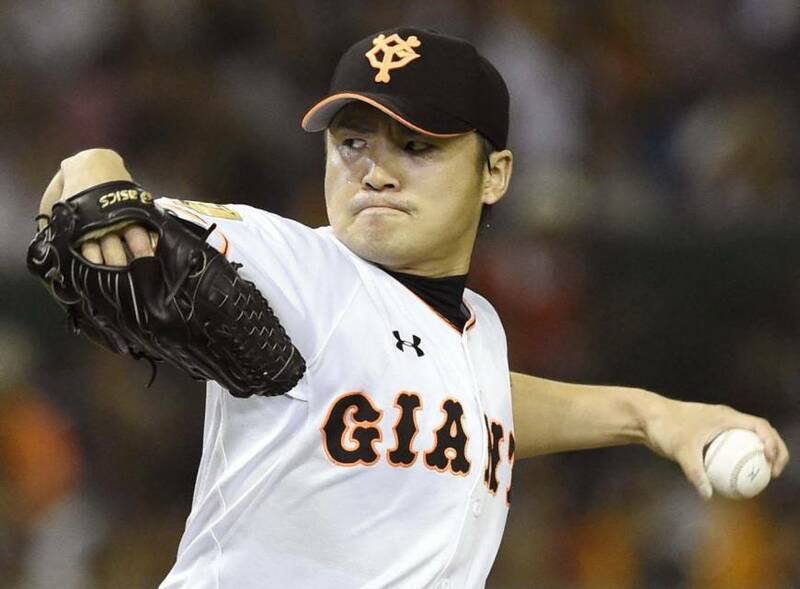 Hayato Sakamoto had a two-hit night and drove in a run for the Giants, and Yoshiyuki Kamei also chipped in with an RBI. The win came in yet another close game for the Giants. Six of Yomiuri’s last seven games, including each of the last five, have been decided by one run. “We’re in good condition and doing what it takes to win the close games,” Hara said. The Swallows continued their free fall, losing for the ninth straight game. Yakult, which had been atop the Central League in late April, is in last place, 8 1/2 games behind the league-leading Yokohama BayStars. Starter Masanori Ishikawa kept his team close, but the Swallows couldn’t quite get their bats going. Ishikawa (2-5) allowed three runs on five hits over five innings. He struck out five and walked two. Kawabata’s home run was his second of the season. He finished 2-for-4. The Giants got the scoring started with Kamei driving in the first run of the game with an RBI single in the third. The next batter, Sakamoto, knocked in another run with a single to put Yomiuri ahead 2-0. Yakult’s Takahiro Araki singled with one out in the top of the fourth and Kawabata tied the game his home run to right. Shuichi Murata got the Giants going with a double to lead off the bottom half of the fourth. He tagged up and went to third on a fly ball by Hisayoshi Chono, and Sugiuchi brought in the run with his single to center. The Swallows tried to put together a rally in the sixth, as pinch hitter Wataru Hiyane began the inning with a double and Tetsuto Yamada drew a walk. Araki laid down a sacrifice bunt to move both runners up a base. Kawabata struck out looking for the second out and Kazuhiro Hatakeyama drew a walk to load the bases. Yuhei Takai worked the count to 3-1, but lined out to right for the final out of the inning. Aarom Baldiris hit his second decisive home run in two days, lifting the Yokohama BayStars to a 2-1 win over the Hiroshima Carp on Saturday in the Central League. A night after hitting a come-from-behind two-run shot to the opposite field at Mazda Stadium, Baldiris took Carp lefty Kris Johnson (4-1) into the upper deck in left in the fourth inning for his sixth home run, another two-run blast. Shoichi Ino (3-2) started for BayStars and allowed a run over the distance for his first complete game of the season. The right-hander scattered eight hits and three walks, while striking out eight. He walked off the winner after getting the final out on the warning track with his 140th pitch and the potential tying run on third base. The win was Yokohama’s fifth straight. Rainel Rosario manufactured Hiroshima’s only run in the bottom of the fourth. Rosario opened with a single, went to second on a wild pitch, advanced to third on a fly out and scored on Shogo Kimura’s one-out sacrifice fly to the warning track. Johnson allowed seven hits and three walks over seven innings, while striking out eight. At Nagoya Dome, Yudai Ono (5-1) allowed three walks and hit a batter in a two-hit shutout, and Ricardo Nanita plated the game’s only run as Chunichi won a pitchers’ duel against Hanshin ace Atsushi Nomi (2-5). At Sendai’s Kobo Stadium, Tohoku Rakuten overturned a two-run deficit in a four-run seventh inning to beat Chiba Lotte. Gaby Sanchez tied it with a two-run homer and pinch hitter Shintaro Masuda singled in the go-ahead run. At Sapporo Dome, Ryoichi Adachi’s first homer of the year, a two-run shot, provided all the offense and Brandon Dickson (5-3) threw seven innings to earn the win as Orix handed Hokkaido Nippon Ham its first shutout defeat of the season. At Fukuoka’s Yafuoku Dome, Yuki Yanagita went 3-for-4 with a two-run double and a grand slam for a career-high six RBIs as Fukuoka Softbank hammered Yusei Kikuchi (0-2) in a win over league-leading Seibu.